Let these Positive Affirmations help you to have a positive attitude toward life, and to think positively. My Peace is Counterpoint to the Clamor of the World. I am a unique expression of the universal fabric of creation. I sail the seas of life as the MASTER of my ship. and trust my intuition to deliver inspiring visions of my future. I Dream with Powerful Intention. I Dream with Powerful Vision. I am not a slave to my thoughts or emotions. I Sing Wild Songs Of Adventure. I CHOOSE with Open Mind and Open Heart. 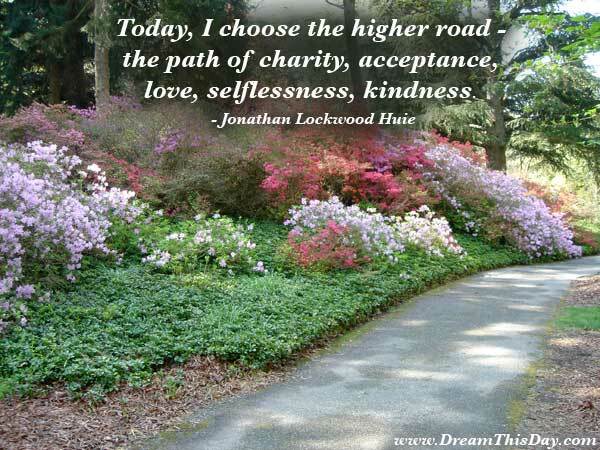 I choose acceptance and compassion toward all humanity. I open myself for the word of Spirit to flow through me. My Mind Sparks; My Soul Sparkles. Today is my day to dance lightly with life. I skip on the beach, and play with the waves. that has caused me harm or suffering. Today, I will be gentle with myself. Thank you for visiting: Positive Affirmations.